I discovered the poet David Wagoner, when I was around 15 or so. I was blown away by the way he talked about death, both of humans and of forests. He's a poet who made an impression upon me as a human and as a writer. Several years ago, when CK and I were in those first awkward weeks of a relationship, I invited her to a friend's birthday party. He requested that in lieu of gifts that his friends put on a talent show for him. I read poetry, it is something I learned to do in high school, even did it competitively into college. Yep, forensics. Yep, competitive public speaking. I was one of those kids. I really loved it and the skills I learned in it have continued to be useful to me to this day. For part of a season I had a whole set of dark, death-y poems of David Wagoner's I read. There was a year in high school where we lost a student from each class; the junior class loss was a friend, not a close friend, but we were on the swim and water polo teams together. The poetry fit. I'm not sure if I found Getting There when I was younger. However, when searching out the "right" poem to read to a friend to celebrate his fortieth birthday, I came across it. 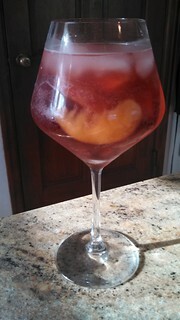 My friend loved it as well as my choice of Pablo Neuruda's Ode to Wine (this poem follows at the bottom of this post, because it is just too marvelous to miss). I feel like I have begun getting somewhere. Some place where I feel like I'm finally on a path and not, yet again, thrashing around in the brambles, hopelessly lost. While I was on retreat in November for Level 2 Integrated Movement Therapy training the two-year anniversary of the last time I saw my Mother passed. Two long years, one year which felt as though it consisted almost entirely of learning how to sleep again, since making the decision to not have any interactions with my Mother because she is incapable of not treating me abusively. Kind of a big anniversary. However, all told, being in training with my teacher, at a place I have so quickly come to love, seemed like as good as any place to be. The other option probably would have involved snuggling in the bed with dogs and cats. Not that the home option is bad, the retreat option just seemed better, like it was probably a really good place for me to mark that anniversary. 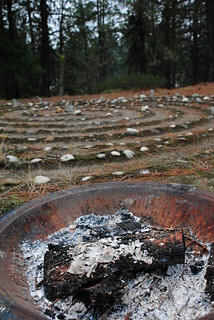 The actual day, the day where I last saw my Mother, was our last night of the retreat and we had a small fire ceremony involving a nighttime walk in the triple-spiral labyrinth at the Grunewald Guild. Before going out we reflected on a word, a phrase, something we wanted to work on releasing, letting go of. I picked a pretty powerful word to offer up to the fire. The anniversary hadn't felt as though it was really bringing me too low most of the week. I was grateful too feel on a more even keel then I had back in September. 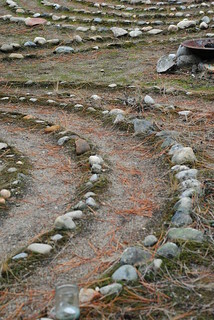 That's until I was halfway through the second spiral and I felt as though all the anger, grief, and profound loss I have felt since that day just hit me all at once. For a moment I stumbled, nearly falling out of the labyrinth I was walking in. I made my way around it, offered something it is high time for me to let go of to the fire, crying steadily all the while. I've had anxious, restless dreams since returning. My brain continues to try and integrate, process things. Today I saw my massage therapist who helped release the profound tension in my upper body I've been carrying since the fire walk. Thanksgiving is the day after tomorrow. Friends are coming over, our longstanding tradition. The transition into the winter holiday season, starting with Thanksgiving, still feels a little painful. However, it feels like I've been getting there more easily these days. *"Getting There" by David Wagoner, from Traveling Light: COLLECTED AND NEW POEMS (Illinois Poetry Series) © University of Illinois Press, 1999.